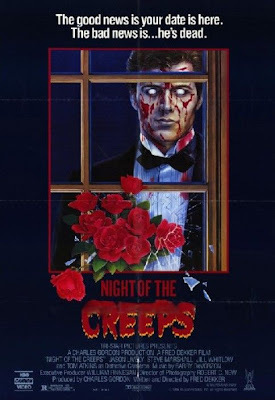 The Horror Digest: Night of the Creeps: Murray Futterman is Back! Oh yes! I love this movie. With the Futtermanlove going on, I'm curious if you've seen Corman's Bucket of Blood? It's pretty much his masterpiece, I think. Yeah, he's the lead, and it's really weird. 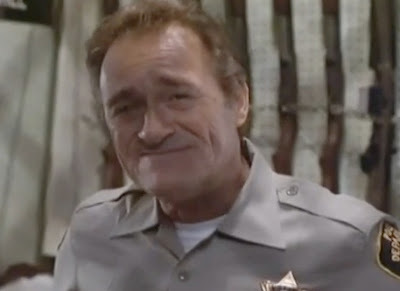 I too am used to him just being the guy who pops up in Joe Dante movies. Which IS awesome. I love this movie to death, I mean I adore it! I loved the alternate ending on the film! The one with the flying alien spaceship returning to look for the container with the slugs. One of my favorite horror movies ever, it has everything you could ever want, aliens, slugs, zombies, serial killers, exploding heads, tough as nails cops, secret government labs...everything! Fred Dekker, you made a masterpiece of B-cineman, I salute you. "Creeps" is my favorite 1980s horror flick... and my favorite '80s horror-comedy flick! In the DVD extra's, director Fred Dekker is interviewed and says the studio decided to film his spec script "as is" - no changes necessary as it was already perfect. 'nuff said! Turns out, this sounds way like Slither, but given Slither is way newer, I guess Slither is the one at fault. But wormy thing from space crawls into your mouth, lives in your brain and turns you into a zombie. Samesies. I must be getting old! 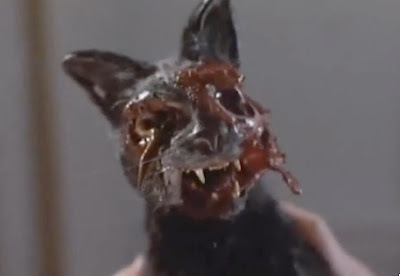 I saw this on the big scren in 1987 and it is still one of my all time favorite horror/comedys. You may be interested to know the cinema versions ending was slightly different from the video releases. On the video the slimey alien bug things in the very last scene slither into a graveyard and the film ends. In the cinema this scene was cut out.